A Spinner in Speed Highway. 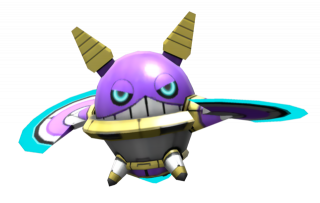 The Spinner's design has been inconsistent throughout the series, but it retains the same design concept: it has a purple hemisphere-shaped head with menacing cyan eyes, pointy yellow ears, and blade wings attached to its yellow midsection that never stop spinning. Individual Spinners have different behaviors to one another: some will hover in place, others fly around in circles or eights, and there are those who will move towards the enemy once they spot him/her. They are generally very common badniks that serve as Homing Attack stepping stones in a number of situations. Electro Spinners strictly cause electric shocks. Metal Spinners cannot be destroyed. They have only appeared in Sonic Colours so far. Prism Spinners disappear and reappear. They have only appeared in the DS version of Sonic Colours. 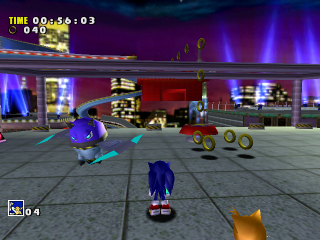 The Spinner would then make a 2D appearance in Sonic Advance 2, where it hovers about in various places in Egg Utopia. It also appears in Sonic Advance 3, where it can be found in Route 99, Ocean Base and Chaos Angel. Because of their spinning blades, they are only vulnerable from the top or bottom. Several years after its last 3D appearance, the Badnik returns in Sonic Unleashed where it is simply known as a Spinner, with a new design sporting cone-shaped ears, cyan eyes and teeth. It is one of the most common enemies in the game and can be found in nearly every daytime stage in the game. In gameplay, the Spinners are virtually harmless as they only hover in mid-air and have no attack patterns, although the player can still take damage from them by touching their spinning blades. They are merely Homing Attack stepping stones, with some of them respawning so the player cannot get stuck. “ These baddies fly by rotating the wings that jut from their sides like a propeller. In Sonic Colours, the Badnik was redesigned again, now looking like a hybrid of both the Adventure and Unleashed designs. They appear in both the Wii and DS versions of the game with the same function as in Sonic Unleashed, along with the introduction of more variants like Metal Spinners. It returns in Sonic Generations, appearing in Speed ​​Highway, Seaside Hill and Rooftop Run in the HD versions, and appearing only in Tropical Resort in the 3DS version. They retain the same function and design from Sonic Colors. They have also appeared in Sonic Jump (2012) and Sonic Jump Fever as obstacles. Like all Badniks in the game, they must be jumped into from underneath in order to destroy them. They can be found in Blue Sky Zone. Appearing only in the 3DS version of Sonic Lost World, Spinners can be found in Windy Hill and Desert Ruins, once again serving as Homing Attack stepping stones that Sonic can use. Their design in this game has been changed yet again, this time to a more cartoony look. In Sonic Runners, Spinners were common obstacles, primarily in Windy Hill, retaining their design from Sonic Lost World. They would either remain stationary or fly back and forth, and were placed either separately or in groups. Unlike other games, the spinning blades wouldn't regularly harm the player. There were also Golden Spinners that would award more points, and Super Spinners that could only be destroyed by Power Type characters or Color Powers. They also appeared with the same purpose in Sonic Runners Adventure. This page was last edited on 18 January 2019, at 19:16.